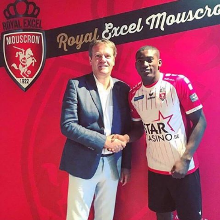 Liverpool loanee Taiwo Awoniyi is poised to make his first return to the Ghelamco Arena in tonight's Belgian First Division match between Gent and Royal Excel Mouscron. The former Nigeria U23 international was originally expected to spend the entirety of this season at Gent but saw his loan spell cut short due to his lack of playing opportunities. Awoniyi failed to find the net in his 16 league appearances for Gent before heading to Royal Excel Mouscron, for whom he has scored two goal in his first three games, and the striker has explained that he did not get the playing time he deserved at the East Flanders club. ''I consider this meeting as normal,. The most important thing for me is the team. I'm not obsessed with scoring this Sunday,'' said Awoniyi to Le Soir Mag. He added : ''On a personal level, my goal is to accumulate playing time to continue my development. I consider goals and assists as a bonus. The 21-year-old Awoniyi scored the game-winning goals against KV Oostende and Genk, handing Royal Excel Mouscron six points in the process.